Trending at $23.66eBay determines this price through a machine learned model of the product's sale prices within the last 90 days. Local pickup in DFW area available on. If there is no visible serial # on the item, permanent inconspicuous marks will be placed on the item. This is important as ones that are not will emit an odor when they warm up. Plinius 9200 Intergrated Amplifier with phonostage. Condition is great, sounds amazing, very high end quality. One note on this amp. : by design, an equalizer cannot be connected between this Main in and Pre-Out. When MAIN DIRECT is selected as the input source, the audio signals are not output at the PRE OUT, LINE 2, REC and PHONES jack (this is written in the owner's manual, page 8). 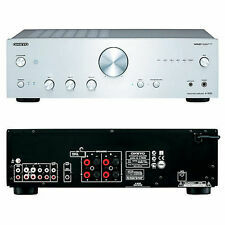 New ListingOnkyo A-9555 Integrated Stereo Amplifier, Tested and Working! Power output: 100 watts per channel into 8Ω (stereo). Input sensitivity: 2.5mV (MM), 200mV (line). Signal to noise ratio: 70dB (MM), 100dB (line). Output: 200mV (line). Frequency response: 10Hz to 60kHz. New ListingIntegrated amplifier Rotel RA-1570 mint - silver. Integrated amplifier Rotel RA-1570 mint - silver. . Mint Condition is Used, this item no scratches dents or chips, please look at the picture, come with amplifier ra 1570, cable, remote and original box, as the picture. Sorry I do not warranty,Shipped with FedEx Ground or FedEx Home Delivery. And signature directly, thank you for looking. NAD C316BEE Stereo Power Amplifier in excellent working condition. HERE IS A LEGENDARY PIONEER ELITE A-35R STEREO AMPLIFIER. IT IS MISSING THE "PIONEER" PLACARD ON THE TOP FRONT LEFT ABOVE THE POWER BUTTON. FRONT PANEL AND CASE ARE IN EXCELLENT CONDITION. TESTED, WORKING 100%. Technical Pro IA25U 600 Watt 2 Channel Integrated Amplifier w/ USB and SD Card Input. The back panel hosts two industry standard RCA inputs for connecting the usual gallery of devices such as a CD, DVD, cassette deck or mixer. Weight: 25.5kg. Input sensitivity: 350mV (line). An EXCELLENT Technical Pro Hybrid Amplifier. 1000 watt amplifier. This is a Technical Pro HS-1000 series. It has been tested with the remote and is in great working condition. Check the pictures and you can see the condition. Condition is Used. I has it powering a pair of infinity bookshelf speakers and an 8" powered amp on the floor. Direct USB connection to my macair and it created a big system with a tiny footprint. It's a retro Stereo Receiver that has a built in Amplifier and it even has an Internet and HD Radio feature. Just look at all of the great unique features listed below. It's made by Outlaw and the model/product number(s) is RR-1260. Model # KA-60. This is a one owner item.from the estate of my father. Unit has not been used for over 12 years. I did plug it in and it powered up easily and all push buttons lit when engaged. This is in very very nice condition. Power output: 100 watts per channel into 8Ω (stereo). Input sensitivity: 0.16mV (MC), 2.5mV (MM), 150mV (line). Signal to noise ratio: 75dB (MC), 94dB (MM), 107dB (line). Weight: 13.2kg. Works excellent. RCA SA-155 Integrated Stereo Amplifier - nos still in box. Excellent condition Shipped with USPS Priority Mail. Integrated amplifier Rotel RA-1570 mint - silver.